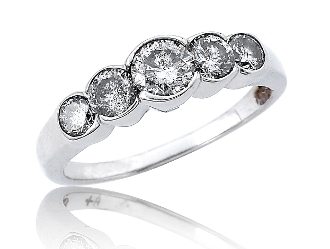 Five Brilliant Round-cut Solitaires are set side-by-side in this sparkling Diamond band. Set in solid 14 Karat highly polished white gold each Diamond ascends to the center stone with a beautiful scalloped effect across the band. The total carat weight is 0.85, with the largest Diamond at the center. A perfect gift for an anniversary, or simply a symbol of your endless affection. For added appeal personalize your item, select our Engrave option and indicate size needed when adding to Cart.